Israel was silent on Saturday on US media reports that it launched new air strikes on Syria targeting a weapons shipment to the Lebanese group Hezbollah. The Israeli military and spokesmen for the defense ministry and prime minister's office declined to comment on the reports. Israel and Hezbollah, a faithful ally of Syrian President Bashar Assad, fought a devastating war in the summer of 2006. CNN television said US and Western intelligence agencies were reviewing information suggesting Israel conducted a strike overnight on Thursday. A diplomatic source in Lebanon told AFP the operation destroyed surface-to-air missiles recently delivered by Russia that were being stored at Damascus airport. Lebanon's army said pairs of Israeli airplanes entered Lebanese airspace three times overnight. The first two entered over the southern city of Sidon at 7.10 p.m., followed three hours later by a second pair that entered over Jounieh north of Beirut, a statement said. The last pair flew in over the capital, the statement said, adding that the warplanes stayed in Lebanese airspace for two to three hours at a time. US media reported that Washington does not believe Israeli warplanes entered Syrian airspace to conduct the strikes. 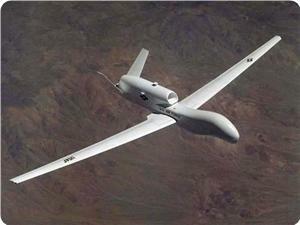 A senior US official told NBC News that the air strikes were probably tied to delivery systems for chemical weapons. But a senior Israeli defense official flatly rejected the notion that Hezbollah even wanted chemical weapons. Amos Gilad said the militant Shiite group "is not eager to get its hands on those (chemical) arms. It is eager to take weapons systems like rockets." "With chemical weapons it has problems," he said in remarks at a public event, relayed by Israeli media. "Chemical weapons can kill those who don't know how to use it too." "I want to calm everyone here. Hezbollah doesn't have chemical weapons," he told the audience. White House and Pentagon officials declined to comment on the air strike reports. But Republican Senator Lindsey Graham of South Carolina, who serves on the Senate Armed Services Committee, was quoted as telling an audience that Israel had indeed bombed Syria. "Israel bombed Syria tonight," Graham was cited by the Politico news website as saying in passing, without offering any further details. The Israeli military on Saturday declined comment and a defense official said only that Israel was monitoring any possible transfer of chemical weapons. Israel is "following the situation in Syria and Lebanon, with an emphasis on transferring chemical weapons and special arms," the official told AFP. If confirmed, this would be the second Israeli air strike on Syria this year. Earlier this month, Israel implicitly admitted carrying out a January raid on a weapons convoy in Syria thought to be en route to Hezbollah. Israeli warplanes have targeted a Syrian weapons shipment headed for Hezbollah in Lebanon, media quoted US officials as saying Saturday, as Sunnis were fleeing a city for fear of a massacre. The news came as US President Barack Obama, under mounting criticism that he has allowed Bashar Assad's regime to cross his own declared "red line" on using chemical weapons, came close to ruling out deploying US troops to Syria. CNN said US and Western intelligence agencies were reviewing information suggesting Israel likely conducted a strike overnight on Thursday. But the United States does not believe Israeli warplanes entered Syrian airspace to carry out the strikes, it added. NBC cited US officials as saying it was believed the primary target was a weapons shipment headed for Hezbollah, the powerful Lebanese Shiite militant group closely allied to President Assad's regime. One of the officials said the strike was likely tied to delivery systems for chemical weapons, but CNN cited officials as saying there was no reason to believe Israel had struck chemical weapons storage facilities. White House and Pentagon officials declined to comment and Israel was tightlipped on the reports. An Israeli defence official stressed to AFP that Israel "was following the situation in Syria and Lebanon, with an emphasis on transferring chemical weapons and special arms." If confirmed, this would mark the second time Israel has hit Syria this year. Earlier this month, Israel implicitly admitted carrying out a January air strike on a weapons convoy thought to be en route to Hezbollah. In Syria, hundreds of families were fleeing Sunni districts of the city of Banias on Saturday, fearing new attacks after a "massacre" in a nearby Sunni village, the Syrian Observatory for Human Rights said. "Hundreds of families are fleeing Sunni neighbourhoods in Banias in fear of a new massacre," Observatory director Rami Abdel Rahman told AFP. The exodus comes after shelling on Sunni neighbourhoods of the city on Friday, and reports of a "large-scale massacre" in a Sunni village nearby on Thursday. Video from Ras al-Nabaa shot by activists and distributed by the Observatory showed a pile of bloodied bodies lying in a street, a least one of them that of a child. 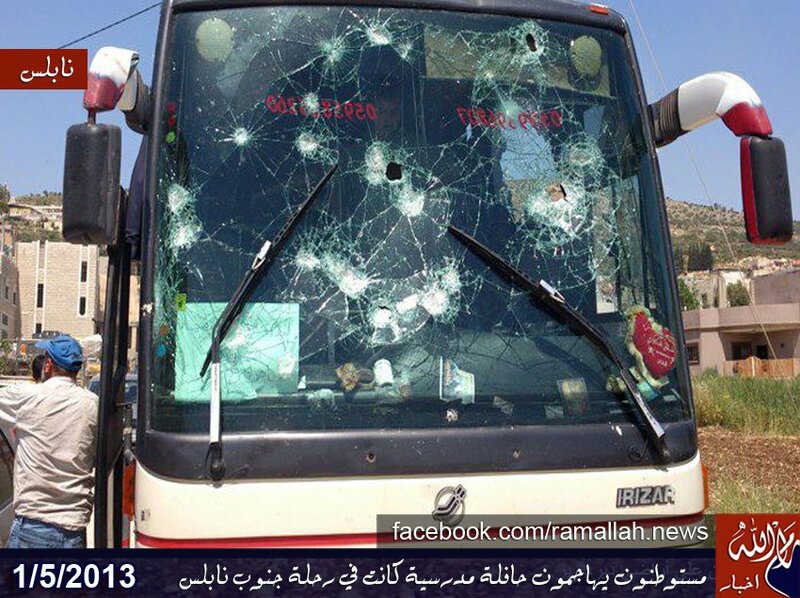 The exodus follows reports of a "massacre" of at least 50 people in the Sunni village of Bayda, south of Banias. The Observatory, which relies on a network of sources on the ground, said the deaths were the result of summary executions and shelling. The Banias region is a bastion of the Alawites, an offshoot of Shiite Islam and the sect to which Assad belongs, while the insurgents battling to topple his regime are mainly Sunni Muslims. The opposition National Coalition denounced a "large-scale massacre" by regime forces on Thursday in Bayda, citing witness reports of civilians being stabbed to death. Syrian state media said troops killed "terrorists" -- the regime term for insurgents -- and seized arms in an operation targeting rebels. Abdel Rahman said troops were raiding homes and making arrests. "I fear that there could be a massacre like the one that happened yesterday in Bayda." The latest violence also took its toll on Good Friday and many Syrian Orthodox Christians did not expect churches to be full for the solemn prayers marking the crucifixion of Christ. "I don't dare to go to church tonight," said Shaza, a mother in Damascus. Speaking in San Jose, Costa Rica, Obama came close to ruling out deploying US troops to Syria, saying he did not foresee a scenario in which that would be beneficial to either country. "As a general rule, I don't rule things out as commander-in-chief because circumstances change and you want to make sure that I always have the full power of the United States at our disposal to meet American national security interests," said Obama. "Having said that, I do not foresee a scenario in which boots on the ground in Syria -- American boots on the ground in Syria-- would not only be good for America but also would be good for Syria." Speculation has mounted the Obama administration could reverse its opposition to arming the rebels after the White House said last week Assad had likely used chemical weapons on his people. The US says the Syrian conflict, now in its third year, has killed more than 70,000 people. 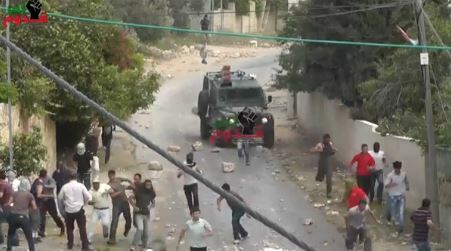 Israeli soldiers, supported by an armored military bulldozer and armored vehicles, invaded the village of Kufur Qaddoum, near the northern West Bank city of Qilqilia, after violently dispersing the weekly protest, and clashed with dozens of local youth; several injuries have been reported. Villagers hold weekly protests against the ongoing closure of the main road of the village, blocking its main entrance since many years, and against the ongoing construction of the Annexation Wall and settlements on lands that belong to the residents. Local sources reported that the army attacked the village from different directions, and fired dozens of gas bombs, and rubber-coated metal bullets at local youths who hurled stones at the invading army, and sprayed them with waste-water mixed with chemicals. Medical sources in the village have reported that dozens of residents have been treated for the effects of teargas inhalation, while one reporter, identified as Aref Tuffaha, was injured in the head after being hit by a gas bomb fired by the army. 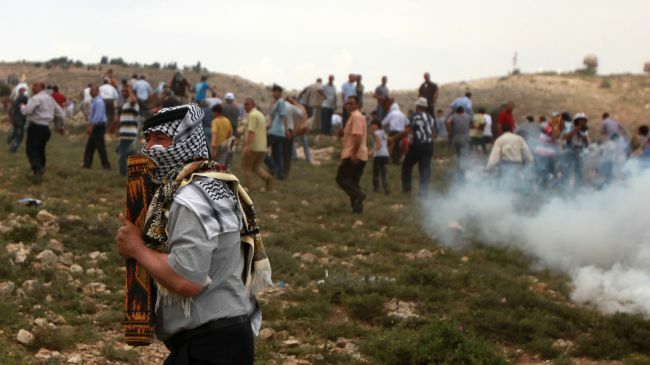 Morad Eshtewy, coordinator of the Popular Committee Against the Wall and Settlements in Kufur Qaddoum reported that the army, supported by armored military bulldozers, invaded several neighborhoods in the village, and fired dozens of gas bombs at local youths who hurled stones at the invading forces. Eshtwey added that that this protest, and all protests that will be held in May, will be conducted in commemoration of the 65th anniversary of the Nakba, marking the Israeli occupation of Palestine, and added that the protests resemble the Palestinian determination to achieve liberation, independence, and the internationally-guaranteed Right of Return of all Palestinian refugees. 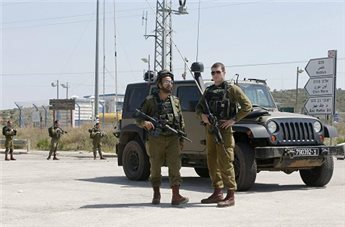 Also on Friday, soldiers attacked the weekly nonviolent protests against the Annexation Wall and settlements, in the villages of Bil’in and Ni’lin, near the central West Bank city of Ramallah. The protests marked the World Press Freedom Day; residents and international and Israeli human rights activists managed to reach the Israeli wall built on lands taken from local villagers. As protestors arrived to the gate of the wall, Israeli soldiers fired dozens of tear-gas canisters at them. 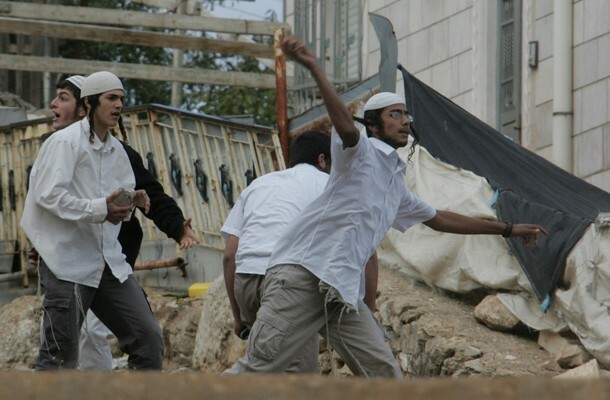 Several youth responded by throwing rocks at the soldiers. A number of residents were also treated for the effects of tear gas inhalation due to the army attack. 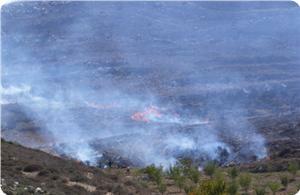 In the nearby village of Nabi Saleh Israeli troops also used tear gas and chemical water, to stop the protestors. Several residents and international supporters were sprayed by chemical water that leaves bad smell on the victim’s body for a long time, in addition to skin irritations. Israeli soldiers also fired tear gas inside residents’ homes causing several women and children to choke and suffer the effects of tear gas inhalation. Furthermore, the army fired dozens of rubber-coated metal bullets and gas bombs at nonviolent protestors in the Al-Ma’sara village, near Bethlehem. Several residents were treated for the effects of gas inhalation by field medics. Troops forced people back into the village using rifle-buts and batons; some protestors suffered bruises in the arms and the back. A Palestinian youth was slightly wounded east of Jabaliya, north of the Gaza Strip, on Friday evening after Israeli occupation forces opened fire at the area. 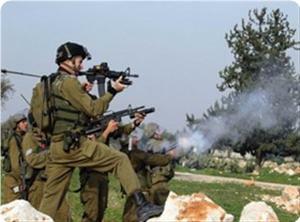 PIC reporter quoted eyewitnesses as saying that IOF troops positioned to the east of Jabaliya opened fire at residential quarters and cultivated land lots injuring a young man in his twenties. Five Palestinians were killed in Gaza and around 90 others were wounded in similar IOF violations of the calm agreement signed last November. Israeli forces have clashed with Palestinian demonstrators protesting against the expropriation of Palestinian land by Israel in the occupied West Bank. Scores of Palestinians took to the streets in the villages of Kfar Kaddum, near Nablus, and Deir Jarir, northeast of Ramallah, on Friday to express their anger over confiscation of their land by Tel Aviv regime and the expansion of settler units. Israeli troops fired tear gas and rubber bullets to disperse the protesters. There were no immediate reports of casualties. Palestinians hold weekly anti-Israeli demonstrations to demand an end to the occupation of their land. Last week, hundreds of Palestinians marched in Deir Jarir village to protest against settler violence after settlers from the nearby settlement of Ofra torched around ten cars in the village, pelted village youth with stones and planted an Israeli flag on a derelict church. 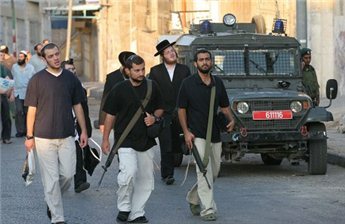 Tension has been rising in the region lately as Israelis have stepped up seizing Palestinian land in order to build more settlements. Nine Palestinians have been killed by Israeli forces in the West Bank since the beginning of the year. Israeli navy fired a number of shells at Gaza coast near Alwaha area west of Beit Lahia, in the northern Gaza Strip targeting Palestinian houses and agricultural lands on Thursday night. 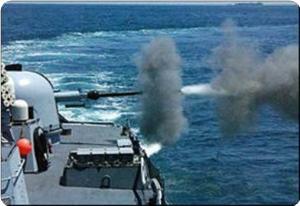 The Israeli navy fired 3 artillery shells, and opened machinegun fire heavily toward fishermen off Gaza coast, the PIC reporter confirmed. 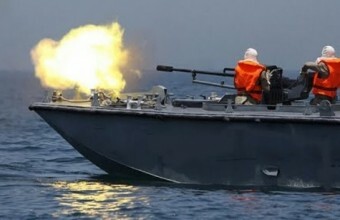 Israeli gunboats opened heavy fire at the fishing boats working off the Sudaniya shore, North West of Gaza city within the three nautical miles off the Gaza shore in light of the Israeli naval blockade imposed on the Gaza strip. As part of the ceasefire agreement that ended the Israeli war on Gaza in November 2012, Palestinian fishermen were allowed to fish within six nautical miles off the Gaza coast, but the army continued to attack the fishermen in their allocated areas, and continued its policy of forcing them to fish within 3 nautical miles. Hebrew media sources reported that a spy drone belonging to the Israeli air forces crashed on the borders of the Gaza Strip. Hebrew radio said on its website that the occupation forces have announced on Thursday that two days ago a spy drone had crashed in the occupied Palestinian territories near the international borders with the Gaza Strip. According to the radio, an Israeli military unit collected the wreckage of the plane while an investigation into the circumstances of the incident has been opened. The preliminary investigations indicated that a technical fault in the aircraft engine led to its downfall. Thursday May 2, 2013, Hebron governor, Kamal Hmeid, held a meeting with the representative of the European Union in Palestine, John Gatt-Rutter, and informed him of the ongoing and escalating attacks carried out by Israeli soldiers and settlers in the Hebron district, especially Hebron’s Old City. The governor told the EU official that the Israeli army is not only ongoing with its harassment and assaults against the residents, but also continued and expanded its military drills in inhabited Palestinian villages and areas, and continued to destroy Palestinian farmlands, grazing areas, and the forcible removal and relocation of the Bedouins and the residents. On his part, Gatt-Rotter said that he is concerned regarding the conditions the Palestinians face in the occupied territories, especially amidst the financial crisis and the ongoing Israeli violations. He stated that the Israeli occupation of Palestine must be ended so that the Palestinians can establish their independent state in their homeland. The leader in the Islamic Resistance Movement Hamas, Mahmoud Zahar, said that the Israeli escalation against the Gaza Strip is not an isolated incident but is part of the Israeli daily aggressions. The resistance will respond to the occupation in a timely manner, he said on his Facebook page on Wednesday, adding that there should be an Arab understanding of our position. Israeli aircraft assassinated on Tuesday the citizen Haytham al-Sahal in Gaza strip, claiming that he was involved in shelling Umm Rishrash (Eilat) recently. The Israeli leaders have escalated their threats against the Gaza strip following the formation of the new Israeli government to impose Israeli control after the resistance victory during al-Furqan and Shale Stones wars. 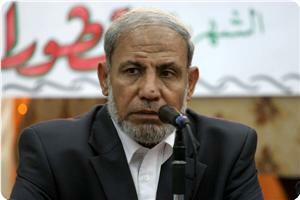 Hamas called on Egypt to pressure the Israeli occupation in order to commit to the truce and stop its aggression. 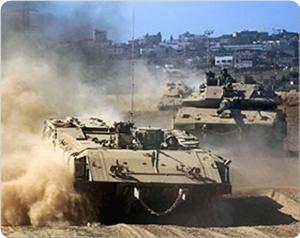 "We will not accept the sporadic firing of rockets from either the Gaza Strip or Sinai. We will act, and are acting, in order to defend Israeli citizens," the Israeli war minister said. The British minister for the Middle East expressed concern Wednesday about recent violence in the West Bank and Gaza, a statement from his office said. "I am very concerned about recent developments in both the West Bank and Gaza. At this critical time for the two state solution, we need dialogue, not violence," Alistair Burt said. The British minister condemned recent rocket fire and an Israeli airstrike on the Gaza Strip as well as the fatal stabbing of a settler near Nablus, calling on both sides to "take advantage of Egyptian-brokered talks to deal with key issues." "Britain has been clear that 2013 is the vital year for peace in the Middle East. We will continue to work to ensure that the aspirations for peace of both the Israeli and Palestinian peoples are met," he added. Israeli army maneuvers east of Jenin city caused fire to Palestinian cultivated land in Jalbon village destroying 35 dunums of barley in the process. Ziyad Abu Arra, owner of the land, told the PIC reporter on Wednesday that Israeli occupation forces fired teargas canisters into his land on Tuesday night and started the fire. He said that the fire destroyed all his crop of barley, which is his sole source of income. 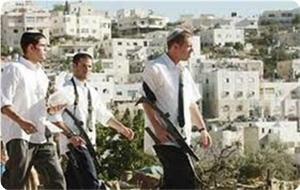 He charged that the IOF crime is the latest in a series of violations against Palestinian land in the area. Abu Arra appealed for compensating farmers affected by such violations and for prosecuting those responsible for them. Abdul Karim Yousef Shweiki, 32, suffered moderate to severe injuries after being stabbed while working at “Me’a She’arim” in West Jerusalem. He pointed out that up on arrivalat the hospital;they were told that Abdulkarim is in the operating room, a result of being stabbed. He also indicated that Abdulkarim was stabbed three times; above the heart, in the stomach and in the waist and is in the ICU in Shaare Zedek hospital, adding that the family are not aware of the details of the incident and the police is saying they are investigating the matter, pointing out that Abdulkarim is receiving treatment and is under drugs ’influence. He said that according to preliminary investigations, he was stabbed, and two hours later was seen by somebody walking by while being under the stairs in one street who ended up calling the ambulance which transferred him to the hospital. A while ago, the Israeli police have released Mohammad Shweiki and Mohammad Hammouri after holding and interrogating them for the past few hours. In a related context, a number of Jewish extremists attempted to attack Mohammad Hammouri this morning while being at work in “Me’a She’arim” as they have followed and threatened him with death, directing abusive words to him. He hardly managed to escape. Some 2,000 Israeli army reservists have been called up to take part in a surprise large-scale drill on the border with Lebanon. 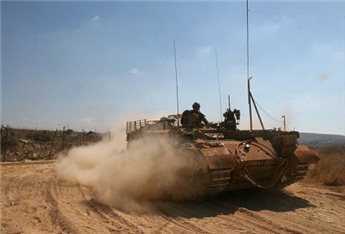 The drill began on Sunday evening, with the Israeli media considering the exercise as a test of Israel’s ability to quickly engage Lebanon. “The scenario involves Lebanon, but it could also be Syria,” a senior military source said, stressing that the drill aims at assessing the preparedness of the Israeli troops. The source went on to say that the surprise drill, which involves live-fire exercises, would end on Thursday. “The drill includes a change in the division’s mission; the division must create a new combat procedure based on a new operative plan within 48 hours,” the source added. The drill comes amid the escalation of tensions between Israel and Lebanon over the Tel Aviv regime’s violations of Lebanon’s airspace. 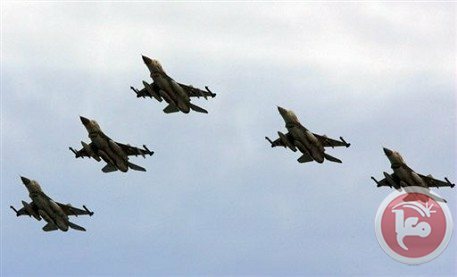 On Tuesday, six Israeli military aircrafts penetrated Lebanese airspace and flew over several areas of the country. A Gaza fisherman was seriously wounded on Wednesday after an accident off Gaza's coast. 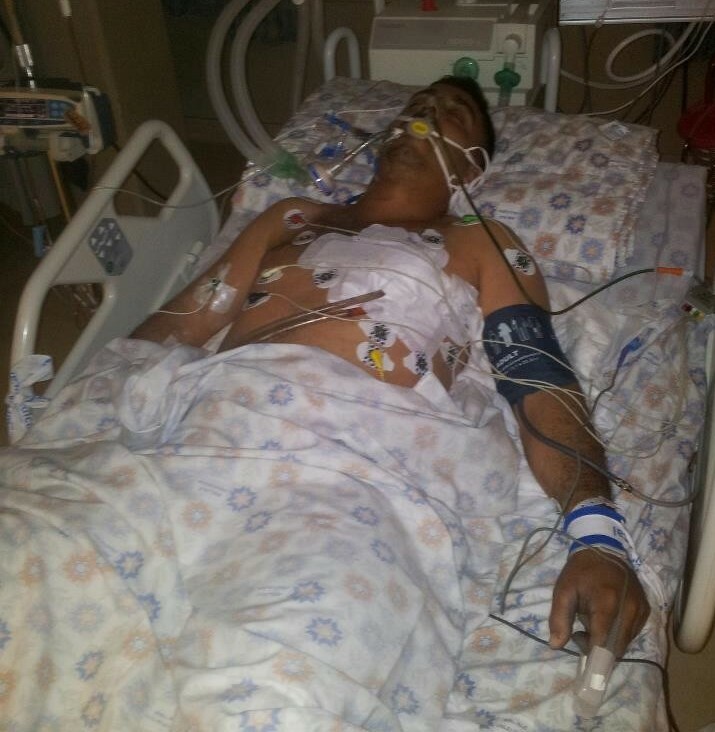 Adel Baker, 51, suffered serious head injuries after falling from a fishing boat near Rafah, Ma'an's reporter said. He reportedly hit his head on the boat's anchor after Israel's navy fired warning shots at several fishing boats, causing him to panic and fall. He was transferred to the European hospital for treatment and is said to be in a serious condition. Gaza's health ministry had earlier reported that Baker was shot by Israel's navy. An Israeli army spokeswoman confirmed that Israeli forces fired warning shots at several boats after they deviated from the "designated fishing zone." Israeli rights groups slammed the move as "collective punishment" of Gaza's population. "B'Tselem calls on the military to rescind its latest decision and the restrictions imposed on fishermen in the Gaza Strip in the past years, and to permit fishing in the 20 (nautical) miles range, as was set under the Oslo agreements." 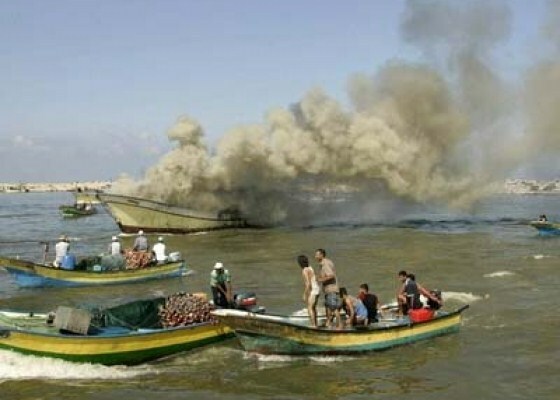 Tuesday April 30 2013, the Israeli navy opened fire at several Palestinian fishing boats along the coast in the Gaza Strip; damage was reported but no injuries. Local sources reported that, earlier on Tuesday, the Navy opened fire at several fishing boats near Gaza City, and that, on Tuesday evening, the Navy opened fire at fishing boats near the An-Nusseirat refugee camp and Deir Al-Balah in northern Gaza. A month ago, Israel reinforced an order obliging all Palestinian fishermen in Gaza to fish within only three nautical miles of the Gaza shore, instead of six miles that Israel agreed to as part of the ceasefire agreement that ended the Israeli war on Gaza last year. There are approximately 4000 Palestinian fishermen in Gaza. Under the Oslo accords in the mid-nineties, the Palestinians are allowed to fish in 20 nautical miles off the Gaza shore, but in 2008, Israel unilaterally reduced the fishing area to only three nautical miles. The fishermen are repeatedly attacked even within the three nautical miles, an issue that denies denying them, and their families, from the only source of livelihood. 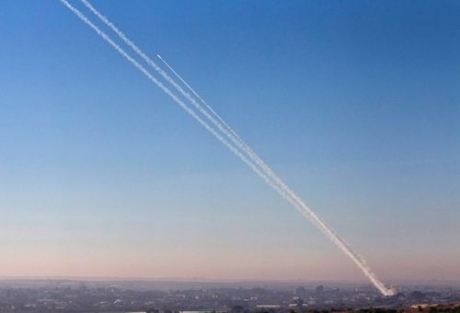 Tuesday evening, April 30 2013, the Israeli Air Force fired at least two missiles into an area believed to be used as a training center for Popular Resistance Committees, northwest of Rafah city, in the southern part of the Gaza Strip. Local sources reported that the Air Force bombarded the Nasser Camp, leading to excessive damage but no injuries. Meanwhile, the Ansar Brigades stated that its fighters fired five shells into the Israeli areas of Holit, Nir Yitzhak and Kerem Shalom (Karem Abu Salem). 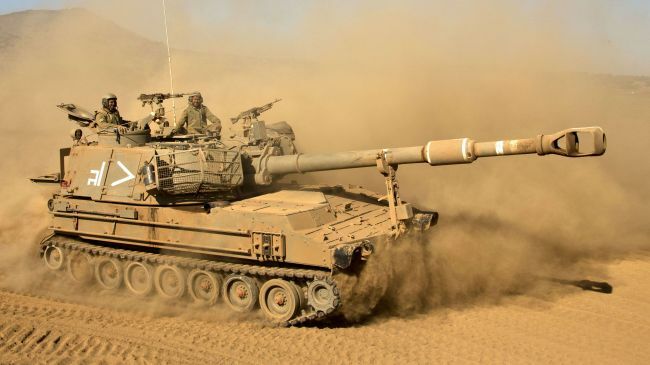 The Brigades added that the shelling comes in retaliation to the latest Israeli military escalation against the Gaza Strip. Earlier on Tuesday, that the army fired one missile at a motorcycle driven by Haitham Mas-hal, 29, leading to instant death while two residents were injured, and were moved to the Al-Shifa hospital in Gaza. Mas-hal is from the Ash-Shaty’ refugee camp; he worked as guard at the Ash-Shifa medical center. Both of his legs were severed due to the blast; he also suffered various injuries that led to his death. 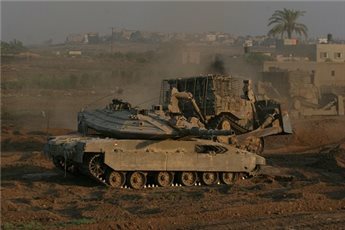 The attack was carried out shortly before a number of armored military vehicles invaded the Ash-Shujaeyya neighborhood, east of Gaza city. 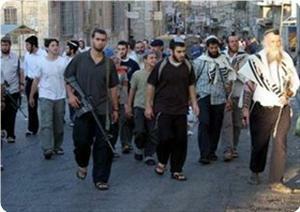 The Shura Al-Mujahedin Salafist group in Gaza, issued a press release stating that the slain man is one of its leaders. Israeli warplanes launched two raids on a position for the Palestinian resistance to the west of Rafah, south of the Gaza Strip, on Tuesday night. Local sources told the PIC reporter that the warplanes targeted a position for the Quds Brigades, the armed wing of Islamic Jihad, but no casualties were reported. An earlier Israeli aerial raid on Tuesday morning killed Haitham Al-Misehal north west of Gaza city. A political commentator believes that the Israeli regime is trying to provoke Palestinian factions into a war by launching airstrikes on the besieged Gaza Strip, Press TV reports. “I think the Israeli military forces are trying to violate the truce and they are doing so and they are trying to incite Hamas and Islamic Jihad and other Palestinian factions to respond in order to weaken those Palestinian factions in the future by attacking the Gaze Strip,” Hani al-Bassos, with the Islamic University of Gaza, said in an interview with Press TV on Tuesday. On Sunday, Israeli warplanes carried out three airstrikes on areas in the southern town of Khan Younis and near the town of Rafah in southern Gaza. In early April, Tel Aviv also conducted airstrikes on Gaza for the first time since a truce ended an eight-day Israeli war on the Palestinian territory in November 2012. Some 177 Palestinians were killed and about 1,200 others injured in the Israeli war from November 14 to 21. Gaza has been blockaded by Israel since June 2007, a situation that has caused a decline in the standard of living, unprecedented levels of unemployment, and unrelenting poverty. Israel denies about 1.7 million people in Gaza their basic rights, such as adequate healthcare and education.